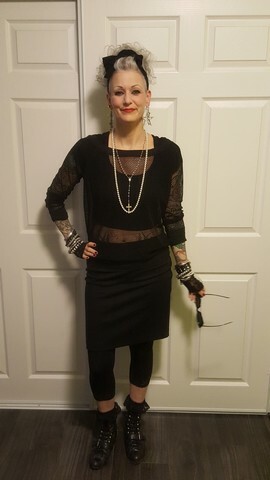 Recently, I was invited to and attended a birthday party with a 1980’s theme. We were encouraged to come in costume as our favourite character, person or cultural icon from the 1980’s. Considering that I dressed like her almost every day in the 80s, had three photo albums full of photos, clippings, pins and other memorabilia, bought almost every book ever written about her, possessed all of her music, including 12″ vinyl dance remixes of some songs, tracked down a copy of every movie and concert on vhs and dvd and I could go on – there was only one choice for me…. Yes, The Material Girl herself! It brought back so many memories and coming of age thoughts to get dressed like this again. I still remember the first time I ever saw her in a video on Much Music. It was for Lucky Star. She looked so different from other people and her style was so fresh and unlike anything I had ever seen before. I also loved the song and how simple the video was, just her and two dancers against an all white background. I said “Who’s that?!? !” aloud and my mother took one look at the tv and in her mind replied, “Oh, no.”. It was the beginning of an infatuation and idolization that, while it has waned somewhat over the past 33 years or so, was to be a very influential force on my own personal style, sense of independence and individuality. 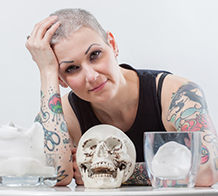 I still wear leggings with skirts, an armful of bangles, head rags and odd and mismatched earrings, not to mention a fierce red lipstick when the mood strikes. Perhaps just not all at once anymore. Imagine my pleasure when fashions from the 80s recently enjoyed a resurrection on the runways and in the pages of fashion magazines. They say everything eventually comes back around in fashion and it was our time I guess, us teenagers of the 80’s. 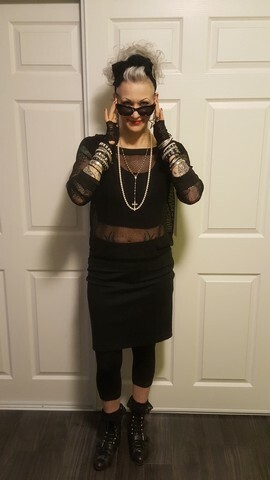 The party was alot of fun and my costume/look was a huge hit. Little did some of them know, that I didn’t have to look any further than my closet and accessories cache to find all the components. It can be our little secret. And, Lucky Star is still, and always will be, my favourite song and video from Madonna.